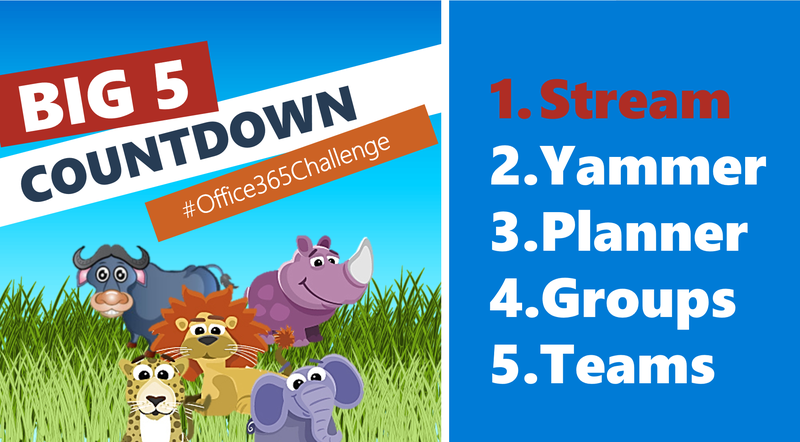 #Office365Challenge – It’s the Big 5 Countdown (African Style). My focus for today, and the 4, final days following, will be the communication tools available to us. Today I’ll give an overview of Stream and what to expect. 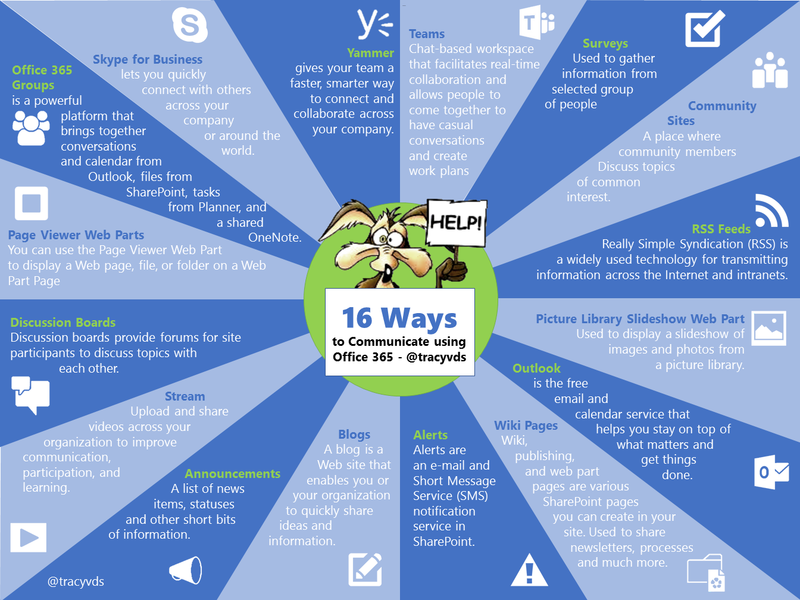 Before we get started with Stream, I would like to share an Infographic I’ve created around the Communication Methods in Office 365. I will not declare this an exhaustive list – but it’s a good start. If you find this useful, please use, circulate & share. I do think we forget how many options we have and the different mediums. Many of these are one-way communication tools but as effective when it comes to knowledge sharing, change management & training. It’s important that companies acknowledge all these options and clearly define a strategy around when to use what. Don’t be mistaken in thinking that “people should know”. As part of my Big 5 Grand Finale I’ll give an overview of Streams. Many days ago I thought I would run out of content to write about, and I didn’t. There are so many features I haven’t even mentioned at all. 5 Big ones, as you know, will be Stream, Yammer, Planner, Groups & Teams. These will only be overviews, not quick reference guides, I’ll definitely get into those later. A new business video service that makes it easier to access and discover video content inside your organization. Microsoft Stream builds upon the learnings and success of Office 365 Video, and over time the two experiences will converge, making Stream the de facto video experience in Office 365. Basically it’s similar to YouTube – internally for your organization. Apart from being a great place to load company announcements / monthly wrap-ups. I see Stream as the future of learning. Focussed content, no advertisements. Just imagine how this can change Induction for companies. Video that explains all you need to know accompanied by a Bot you can ask questions to get you started. Below are excerpts from the above site - I cannot explain it better in my own words if I tried. Upload encrypted videos for the whole company to watch—share insights, updates, and keep everyone informed. Share product research, brown bag sessions, company events and more—anyone can upload a video. Create custom channels to make it easier for your co-workers to learn, train others, and discover company information. 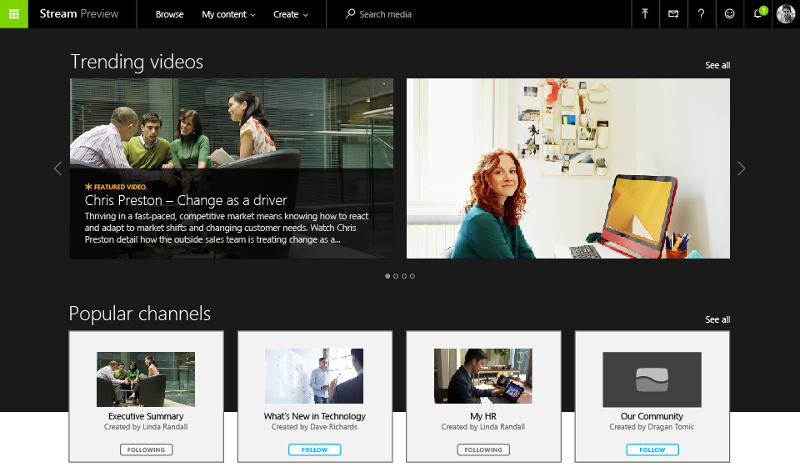 Microsoft Stream delivers video to your whole company, whatever its size. Organize your company videos into custom channels to deliver fast access to HR materials, product information, and more—viewable from anywhere, on any device.